Melbourne's Maribyrnong River - there she flows! Meandering through Melbourne’s north-western suburbs, the scenic Maribyrnong River region affords visitors with various recreational opportunities. It’s a river rich in history and worthy of exploration; whether you’re a local or a visitor to Melbourne. Crossing point: The Afton Street footbridge in Essendon is a crossing point over the Maribyrnong River for walkers, joggers and cyclists. Palm trees lining the river in this section are a feature. Wetting a line: Recreational fishing is pursued along the Maribyrnong River and catches of bream are common. 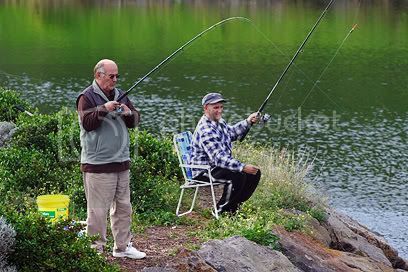 Popular fishing spots include Footscray Park, Brimbank Park and Edgewater Estate. Pipemakers Park, Footscray Park and Brimbank Park are riverside locations where visitors can enjoy a picnic lunch and utilise barbecue facilities provided by local councils. For family groups, modern playground equipment is located in the expansive Brimbank Park. Overlooking the river, the Anglers Tavern in Maribyrnong provides generous bistro-style meals and relaxed outdoor dining. Spectacular views of the Melbourne city skyline can be seen from various vantage points, with Footscray Park and the lookout in Lily Street, West Essendon being highlights. 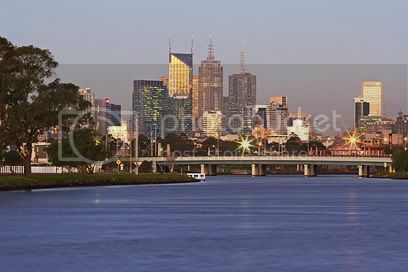 High-rise splendour: Melbourne city skyline at sunset from the bank of the Maribyrnong River at Footscray Park. Within Brimbank Park at Keilor, stately River Red Gums line the river. The Leaping Lizard Café situated in the Visitors Centre is a top spot for breakfast, lunch and coffee. Brimbank Park has kilometres of shared walking and cycling paths, and birdlife photography opportunities abound. The Arundel Road Historic Bridge in Keilor is 100 years old in 2007. It’s a rustic one-lane timber structure and it serviced the market gardeners during the years it was open to traffic. Anglers Tavern – 2 Raleigh Street, Maribyrnong. Melway Ref: Map 28 D8.Open 7 days. Lunch 12noon – 2.30pm and Dinner 6.00pm – 9.00pm. 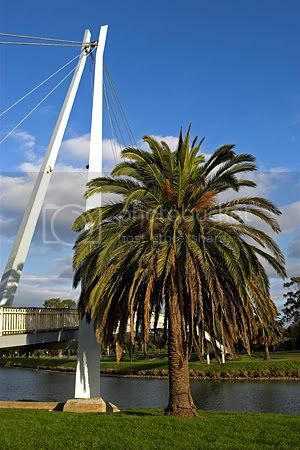 Footscray Park – Ballarat Road, Footscray. Melway Ref: Map 42 D2. Scenic Lookout – Lily Street, Essendon West. Melway Ref: Map 27 J4. Brimbank Park, Leaping Lizard Café – Keilor Park Drive, Keilor East. Melway Ref: Map 15 B10. Open seven days from 8:30 am – 4:00 pm. Serving breakfast, lunch, light meals, and catering for picnics and functions. Professional Freelance Journalism - the journey has begun. Some of you may be aware I recently enrolled in the Thomson Education Direct Professional Freelance Journalism correspondence course under the tutelage of, Simon Townsend. I’ve completed the first of 16 assignments for the course and received my grading for it. I achieved an A Grade, and that surpasses my expectations. One of the reasons I enrolled in this course was to tap into the knowledge and experience of Simon. He’s been there – done that, in Australia, and done it successfully for over four decades. He comes across as a passionate man and one who is willing to share his vast knowledge. To those who have assisted me in recent times – a big thanks. I’ll continue to do my best to promote as time permits, due to my new and exciting direction. Also, a special mention to my sponsors for the course. Thank you for your support. Cheers and happy days folks. 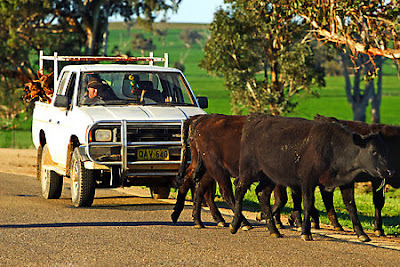 Cattle Drive: The Henry Lawson Way, New South Wales, Australia. 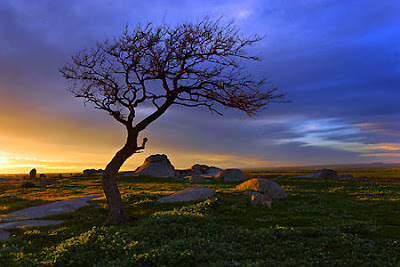 A big thrill to win the Australian Digital Photo Of The Day Members Choice Award for October 2007 with Dog Rocks. The award is a generous $100.00 gift voucher courtesy of Momento. Thanks to all the members at POTD who voted, Russell Stewart, owner of POTD, and to Momento for your valued sponsorship.